It is February 29th, and our apricots and plums are blooming. I mentioned two weeks ago that one of our pluots was blooming. Now the apricots and plums are starting to bloom as well. The Blenheim apricot started blooming first. The photograph above is of Blenheim blooms. The photographs below show the size of this tree that is 3 years old in the ground. I have also attached another photograph of some Blenheim blooms. Our Moorpark apricot is also starting to bloom, but only ever so slightly. A photograph of our Moorpark is found below. Our plums are also starting to bloom. Our Morris plum has also been in the ground for three years, and it has grown the fastest of the plum trees. It also is in bloom with very small, white blossoms. If I had to bet, I think the last of the cold weather is behind us. The forecast for this week is warm and warmer temperatures. While we might still get some temperatures in the mid and high 30s, I seriously doubt, at this point, that we will get any more really hard, killing freezes that could cause damage to the fruit blossoms. My biggest concern at this point is whether enough of our native pollinators are out working. I have seen a few bees gathering around the dandelions, but I have not seen them working the fruit trees. I installed a Mason bee "nest" last summer, and its tubes were half full of coccooned eggs; however, I really have not seen them hatched in large number, yet. Before planting our two apricot trees, I rarely would eat apricots from the store. When I did, they were either mushy, mealy or tough. I also would eat dried apricots, but dried fruit cannot compare to fresh fruit. My eyes were opened when our first crop of Moorpark fresh apricots ripened. Without doubt, fresh, ripened apricots are the treasure of our fruit garden. The taste, texture, and sweetness was otherworldly. Because apricots are so tender and do not ship well, a homegrown apricot is one of the types of fruit that really excels over what you can find in the stores. For that reason, in my opinion, one or two apricot trees can be a very rewarding addition to your fruit orchard if you have the space. Now, keep in mind that apricots get a pretty bad rap. They have a reputation of being very finicky. One of the main issues is that they tend to bear biennially -- every other year -- or worse. In fact, they have a reputation for sometime producing fruit only once every five years! My trees have produced every other year, to date. A major issue in obtaining reliable fruit production is the vulnerability of apricot fruit buds. Apricots have a reputation for blooming very early in the Spring such that their blossoms are damaged if a late freezes occurs (which is often the case in Texas and the South) -- harming fruit set. Many apricot varieties will be the first to bloom in your garden. This risk can be reduced by selecting later blooming varieties. Northwest Texas fruit grower Richard Ashton wrote an informative article on growing Apricots in Texas for The Texas Gardener a few years back, and this article continues to be relevant. You can read the article here. Ashton's website for his Oak Creek Orchard also cites to a prior article printed in NAFEX's Pomona Magazine by Richard Purvis which is equally informative: Apricots - A Wider Geographic Possibility? Texas A&M's material on apricots and other stone fruit can be found - here. In terms of variety selection, Ashton suggests a variety developed at the research station at Prosser, Washington called Tomcot. Ashton states that although Tomcot does not bloom late, it blooms over a three week period of time which means that "if the first blooms are bitten by a late frost the later blooms have a good chance of producing fruit." Tomcat matures early, can be of good size, and I have read several reports that it has outstanding flavor and sweetness. It is a favorite of some growers. Ashton writes that its size makes Tomcot appropriate as a commercial apricot because of its large size and good shipping qualities. Ashton also suggests a central Asian apricot variety called Jerseycot. This variety is a cross between an asian and french variety. It is reported to bloom nearly two weeks later than most American apricot varieties. You may have to do some searching to find this variety. "Hunza - Very sweet, small fruit on a very late blooming tree. This tree takes a little longer to start bearing, not as productive as some but the very sweet fruit are worth it. (Close to 30 brix). Considered a sweet-pit apricot, we have not tried the kernels. We have one hunza variety apricot but there are several hunza type apricot varieties. They come from the hunza valley of far northern Pakistan where people live to be older than in most areas and cancer is practically unknown, the hunza people eat mainly millet and apricot products ie. dried apricots, apricot kernels (roasted) and apricot kernel oil. This variety has a high chill requirement and is only suited for northern plantings. Matures about June 5th in west-central Texas. Good size with excellent taste. Chinese (Morman) - Heavy producer of small to medium, golden fruit with a red blush. Very Cold and late frost hardy. 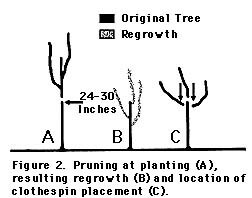 This was one of the first trees recommended for late frost prone areas, now we have others as shown here. This is a very good tasting, semi-clingstone fruit. Some people consider this a sweet-pit apricot, we have not tried them. Blooms and fruit seem to be more resistant of cold weather than most varieties. Matures about June 10th in west-central Texas. Tilton – Good fresh or processed. Medium to large fruit, firm, rich flavored. Adaptable tree, late blooming but not the latest. Ripens about June 1st in west-central Texas. Good sized fruit with excellent taste. Tisdale – Medium sized, freestone, good flavored fruit on a consistently bearing tree. A later blooming tree. From Roy Tisdale in Belton, Texas. Matures early about May 20th in west-central Texas. Medium sized fruit with very good taste. Harglow -- Medium size, dark orange with red blush, firm, sweet fruit on a late blooming tree. Early to mid season ripening fruit. Goldensweet (pp#8932)-- Freestone, sweet (15-18 brix), frim fruit on a moderately vigorous, productive tree. Blooms about a week later than common varieties. Self-fruitful. "Blenheim is a medium size fruit with orange peel and yellow flesh. It has been the most consistent variety across the state and ripens in late June. Moorpark has medium to large fruit with orange flesh that ripens in mid-June. Bryan ripens in late May to early June with orange fleshed medium size fruit. Chinese (or Mormon) seems to be more cold hardy in some locations as it has an extended bloom. Fruit are small to medium in size." Another North Texas grower has told me that Robado is one of his favorites for taste and that he has had success with it. Blenheim and Moorpark are common commercial varieties. I am growing both Blenheim and Moorpark. In my garden, my Blenheim and Moorpark trees are not genearlly the first fruit trees to bloom. The pluots, plumcots, pluots, and cherries bloom shortly before the apricots. My trees have produced fruit biennially, to date. Apricots are self-fruitful, but it is always better to have more than one variety to help with pollination. As to chill hours below 45 degrees, many varieties need 700 hours of chill hours. However, there are varieties that require less. For example, Ashton suggests that Gold Kist has a lower chilling requirement of 300 hours and Katy only needs 400 hour chill hours. Dallas, Texas generally gets 700 - 800 chill hours in a typical year. If you live in Texas and do not know what chill hours you typically get in a given year, go to this site for that information - Texas chill hours. If you live in the Southeast in Florida, Georgia, Alabama, North Carolina or South Carolina, this is a really cool tool to determine your chill hours - Southeast chill hours. California also provides good information - California chill hours. I get more hits and inquiries about growing cherries on this website than any other topic or fruit. Texans and southerners just want to grow cherries, I guess. I find it fascinating that there is so much more interest in growing cherries over the other fruits. People also seem to be interested in flowering cherry trees as ornamentals. If you fall in that category, the Dallas Morning News ran a great article on flowering cherries earlier in the week. You can read this article "Yes, cherry trees can flourish in Dallas" by Penny Ruekberg and Marianne Greene - here. Well, it appears that at least one of my fruit trees is confused by this last week of warm weather. The tree in the photograph above is a 4-in-1 pluot purchased three years ago from Raintree, that turned into a 3-in-1 pluot after one of the grafts failed. The tree is a combination of Splash, Emerald Drop, Flavor Grenade, and Geo Pride, and I do not know which one of these was the graft which failed. If you look closely, you can see that one of the grafts is in full bloom. This is not good. There is nothing else blooming now to pollinate it. Also, there are very, very few bees out right now. In December, I saw a honeybee in some of the salvia nemerosa that have miraculously continued to bloom throughout the winter. But that was it. And I feel confident that our mason bees are not ready to hatch. Further, a hard frost may destroy the flowers or any emergent fruit. This pluot has been the first tree to bloom for the past few years. However, last year, it did not start to bloom until the very end of February, as you can see in this post - Blooming Pluot. And last year was earlier than usual! I cannot remember which of the varieties this fruiting graft is because I did not mark them before someone in my household removed the tags - I have learned from this mistake. Geo Pride requires 550 hours of winter chilling, but I have not seen written anywhere when its bloom time is. Here is a nice photo of a Geo Pride - photo. Flavor Grenade requires 600 chilling hours and blooms in "early mid-bloom season" - photo. Emerald Drop requires 700 chilling hours and blooms in "mid bloom season" - photo. Finally, Splash has a chilling requirement of 650 hours and blooms in "mid bloom season" - photo. Given that the other three are mid-season bloomers, my guess is that this is the Geo Pride that keeps blooming early. So why is this tree blooming early? From what I have read, this early bloom can results from several factors - a variety that is an early bloomer (different varieties have different profiles for when they bloom each year in comparison to other varieties); how many chill hours the tree requires; and whether there has been a break in the winter weather (warmer temperatures can fool a fruit tree into breaking dormancy; additionally, I have read that temperatures above 60 degrees during dormancy can even subtract chill hours from our chill hour totals). 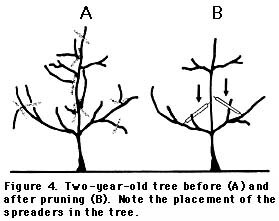 Because we often have warm interludes during our winters in Texas and the South, our fruit trees can often be fooled to prematurely break dormancy if they are early bloomers; consequently, it is often beneficial to plant mid to late blooming varieties in the South. As a side note, I am somewhat surprised that the Minnie Royal and Royal Lee cherries, which have very low chilling requirements (200-300), were not the first to break open their blooms. They are reported by Dave Wilson Nursery to bloom 10 to 14 days before Bing, and cherries are typically early season bloomers.With their low chilling requirement, I feared when I planted them that they might bloom too early and then lose their blossoms with unexpected late frosts. So far this year, they are not blossoming. This is the first full spring following planting of these low chill cherries, so I am still learning about how they will perform in my garden.